I’ve long said that London seems short of escape rooms in its outer circle. Outside the capital, games appear in population centres of less than 50,000, but inside the M25 it appears that they stick to zone 1, which has always seemed a bit strange. Operation Escape is putting that right with their World War-themed games. They’ve currently got two rooms open although, when we visited, they’d literally just opened the second, so our team skipped playing it in order to give it time to bed in. Unfortunately, our timing meant we also missed out on meeting the owner, but this is a family-focused business, and her sister was at the helm to GM us. I always say it’s good to start the immersion before you go in, and Operation Escape obviously believe that too: you’re greeted by an “officer” in uniform who welcomes you to the venue and gives you your brief in character. TO BIGGIN HILL RAF SQUADRON DECODERS. URGENT. IMMINENT AIR ATTACK. ENTER AIR CONTROL OPS ROOM. WARNING. ROOM LOCKS ON ENTRY. YOU HAVE 60 MINUTES TO DECIPHER ENEMY CODE AND STOP ATTACK. After a pristinely presented GM, I had high hopes for the room ahead but, to be honest, it looked a little bedraggled. There were a few period references around the place, but to all intents and purposes it could just have been an old, worn-out office. The mission is to escape that office and find out what the enemy’s plans are and, while that is what you end up with at the finale, it wasn’t the vibe I got while we were playing. The puzzles here are a little challenging – not so much in how to solve them but in how to find the parts . It wasn’t always clear what was actually a puzzle, at least not in the beginning. That became a little more obvious once we’d started to get a feel for the room but, personally, I’d rather have had more, clearer puzzles, which I think would have given the team more motivation in the game. The relatively small number of puzzles might suggest this room was fairly linear, but in fact it was very open. While they did bring you together for key moments, they generally presented you with a set of puzzles that even our four experienced players didn’t race through. There’s a piece of theatre in this game that I really enjoyed but felt could have been improved by changing it slightly to have less significant effect on the actual gameplay and a bigger contribution to the experience. I hope they’ll think about changing it – perhaps triggering it in the run-up to the finale which, in its current incarnation, felt a little lacking in adrenaline. We escaped in precisely thirty minutes without taking any clues, which would have come over the walkie-talkie had we needed them. 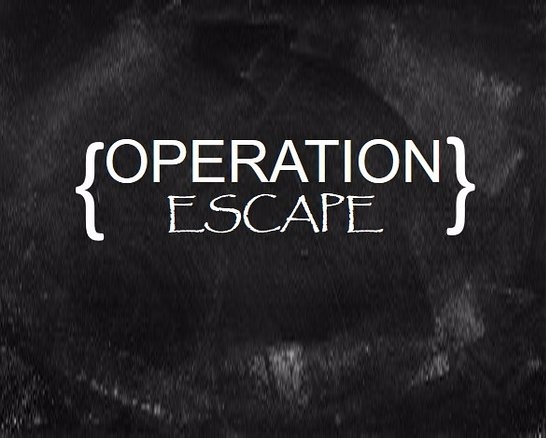 I love what they’ve done with the Operation Escape brand. Making games that are true to history is a great selling point, but I felt that, once I was in the room, that side of the game didn’t assert itself as much I’d have liked. As an enthusiast, I wouldn’t recommend making a trip specially to play here but, if you do, three people is probably the right number – we played with four and it was hard to get everyone fully engaged. New players will likely have fun and could easily take along four or five to help them complete the game, although it may get a little cosy at times! Fingers crossed – Mrs Logic has already played and thinks it’s good so I have high hopes. Should finally get to play during February. Been too busy recently. Played now and I agree – it’s got lots of great points.